Thank you so much for sharing your cabin. The kids loved the whole cabin and we enjoyed the peaceful and serene environment. We caught a rainbow overlooking Lake Fontana. The nearby amenities were fantastic. We will definitely be back again! WE had a wonderful time in your lovely cabin! We came for a family weekend getaway and it couldn't have been more perfect! We enjoyed the lake, hiking, and wonderful evenings on the porch/ We cannot wait to come back and do it again. Your cabin was beautiful and it was the perfect stay again. Thank you for allowing us to make amazing memories that will last a lifetime. Thank you for sharing your beautiful cabin with us. This was our first family trip to NC and this cabin couldn't have been more perfect! We enjoyed traveling the Blue Ridge Parkway, riding the Train, and exploring the waterfalls. Having the opportunity to wake up and come home to the amazing views from this cabin each day was icing on the cabin! Thank you again. Great location! Close to all the activities. Great Smokey Mountain Railroad, Tail of the Dragon, white water rafting, fontana dam, everything! Beautiful house, beautiful decor! Breathtaking view! Location... Made us wish living there year around. It was wonderful to be near of such a beautiful place as Tsali Recreation Park. Thank you for sharing your wonderful cabin with us!. We are from SOuth Boston and we were hoping to get away from the snow and have warmer weather. But it didn't stop us from enjoying the view and the hot tub! We really enjoyed the waterfalls, and Deep Creek Area. We went horse back riding for the first time ever. We hope to come back again soon. 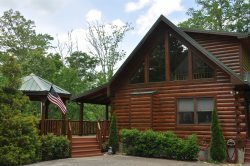 We are from GA and usually stay in Gatlinburg but it has gotten to busy, so we decided to stay near Bryson City.The company was very friendly, professional and easy to deal with. We love the floor plan, view and how it is stocked. We can't wait to come back before the crowds get here. Thank you for sharing your beautiful cabin. Thank you for sharing your little slice of paradise with us! We had a wonderful visit and hope to return soon. Another amazing vacation with GSCR. All I do is call you guys, tell you what I am looking for and one or two e mail recommendations latter our perfect vacation cabin is booked. I don't have to spend endless hours searching for the right cabin and then wonder what bad surprises await me once I arrive. I love renting from you guys, I have never been disappointed. What a beautiful view! Simply breathtaking. In our 2nd day here we went on the train ride. It was a first for us then spent the day just exploring the Great Smoky Mountains. The cabin was perfect. Thank you so much. I didn't want to write a review because I didn't want everyone to know how awesome this place is! Absolutely perfect. Don't hesitate; book it. Was a beautiful weekend to enjoy the deck with morning view of Fontana and hot tub in the evening. Just the cleanest cabin ever!